This is a fantastic and easy donut recipe that bakes in the oven! Okay, donuts are not the perfect food nutritionally speaking, but the worst part of it is the frying. 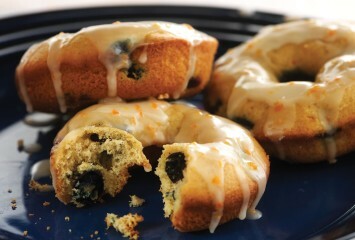 Omit the frying, add healthy blueberries, buttermilk, cinnamon and a fresh orange glaze and they become much healthier. Preheat the oven to 375°F and position an oven rack in the center. Lightly coat the doughnut pans with nonstick cooking spray. To make the doughnuts, in a large bowl, combine the flour, granulated sugar, baking powder, baking soda, cinnamon, and orange zest with a whisk. Melt the butter in a small pot over low heat and set it aside. In a medium bowl, combine the melted butter, buttermilk, eggs, and vanilla with a whisk until it is foamy, about 1 to 2 minutes. Pour the egg mixture into the flour mixture and stir with a large wooden spoon until completely combined. Gently fold in the blueberries until just combined. Do not overmix. Using a pastry bag fitted with a 1-inch round tip, divide the batter equally (using even pressure) between the pans, filling about halfway full. Alternatively, you can use a gallon-sized resealable plastic storage bag. Fill the bag and using scissors, remove 1 inch from one of the bottom corners and proceed with filling the pans as described above. Bake the donuts for 8 to 10 minutes, until they spring back when lightly touched. Remove them from the oven, invert the doughnuts onto a rack, and allow them to cool completely. To make the glaze for this donut recipe, in a medium bowl, combine the powdered sugar, orange juice, and orange zest with a whisk. Mix it together until it is smooth. To glaze the doughnuts, dip the top of each doughnut into the glaze and lift, allowing the excess to drip back into the bowl. Place the doughnuts on a platter and serve. These doughnuts are best served fresh. This donut recipe makes 16 large or 64 mini donuts. When you want a delicious sweet treat you really should try these blueberry buttermilk donuts. The buttermilk makes the dough very tender. They are topped with a luscious citrus orange glaze, which gives the donuts a gourmet flair. If you don’t know how to make donuts, this recipe is a perfect place to start. The directions are very detailed and lead you through the process step by step. The recipe comes from a fabulous little sweets cookbook by Sur La Table called So Sweet! 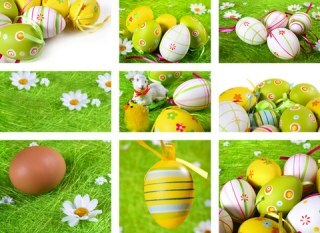 : Cookies, Cupcakes, Whoopie Pies, and More . Sur La Table is the trusted authority when it comes to all things cooking related. Note: The nutritional count is for one mini donut. The larger donuts will obviously have more calories. You will find our Mexican donut recipe here.